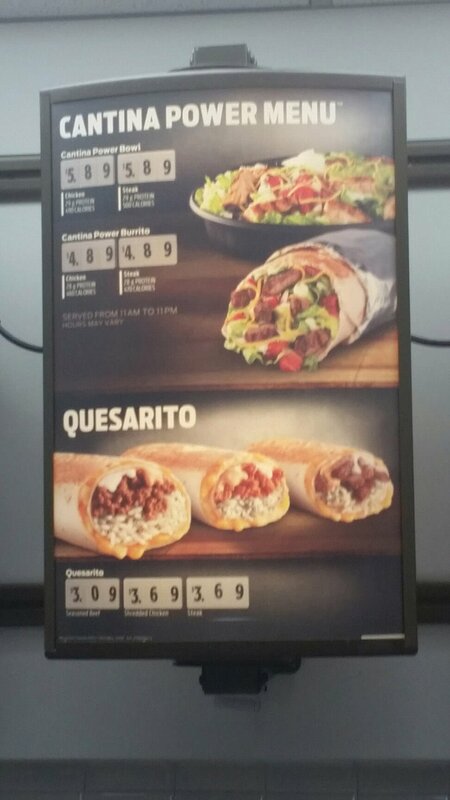 This is the right place for the Taco Bell® menu with prices. Taco bell serves up fast Mexican food in a friendly environment for dine in, drive through or take out. 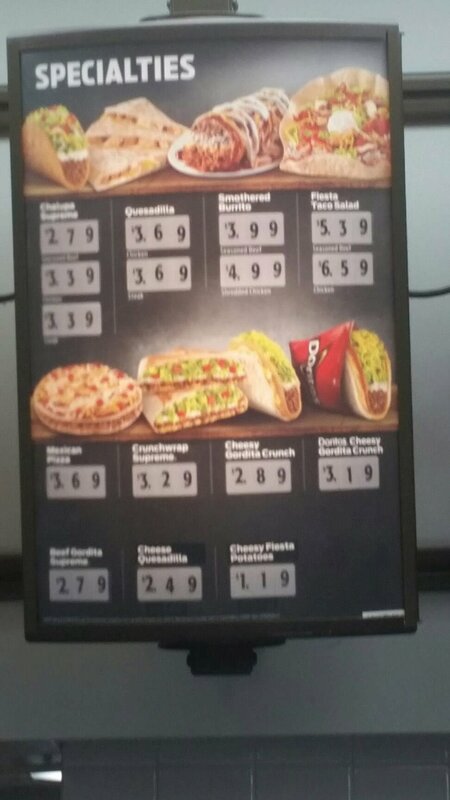 Taco Bell has is an American favorite in fast Mexican food. With many innovative twists on tacos, burritos, quesadillas, and gorditas you have to visit regularly to try the new creations. 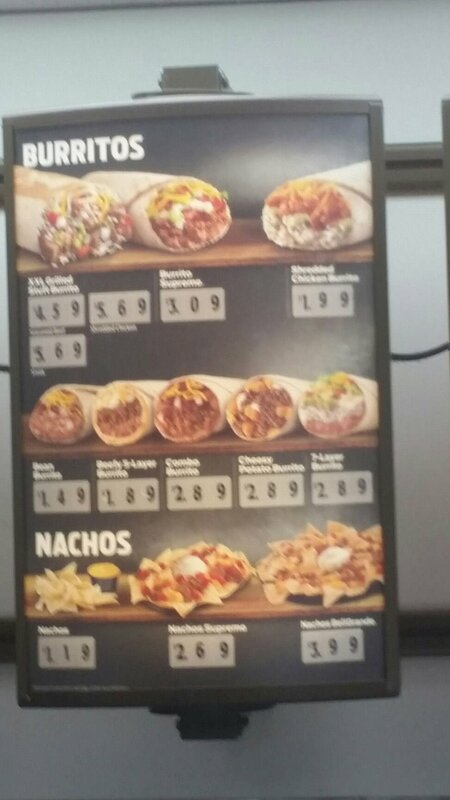 Whether you are heading there for a late night snack, breakfast, lunch or dinner, Taco Bell has a wide selection of Mexican fast food that you can customize to your tastes. Please do not include Chicken or Steak unless indicated. Prices may vary. Served from 11am to 11pm hours may vary. 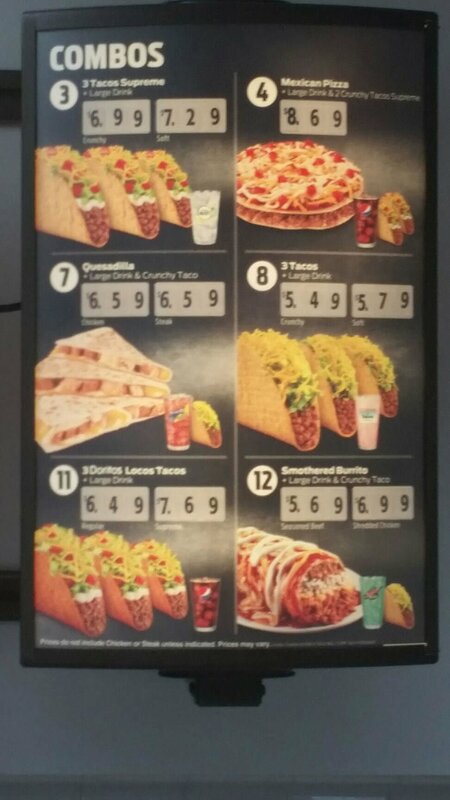 There is a lot to choose from at Taco Bell. If you are heading there for a satisfying snack, consider the Nachos Bellgrande. Crunchy tortilla chips topped with beans, melted cheese, seasoned beef, sour cream and diced tomatoes. If you are looking for more hearty fare, then there is a large variety of burrito and taco combos that let you select your favorites and combine them into a meal for a reasonable price. There are also salads on offer for those that are looking for a lighter option. Masters of combining your favorite Mexican flavors in innovate ways, and for partnering with favorite brands from the grocery store like Fritos® and Doritos®, you will always find something new at your closest Taco Bell. 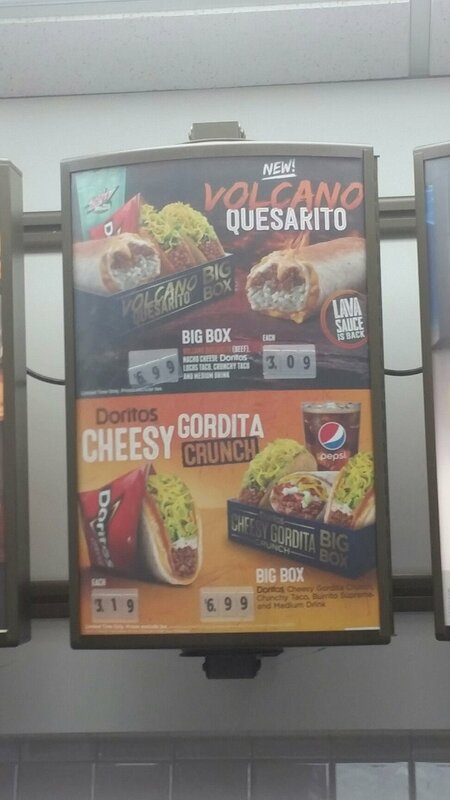 Taco Bell has managed to combine crunchy and soft in this popular item. A crunchy taco shell stuffed with meat, sour cream, cheese, lettuce and tomato is folded inside a soft tortilla shell and then grilled. The result is a delicious blend of your favorite Taco Bell flavors in an easy to eat monster sandwich. 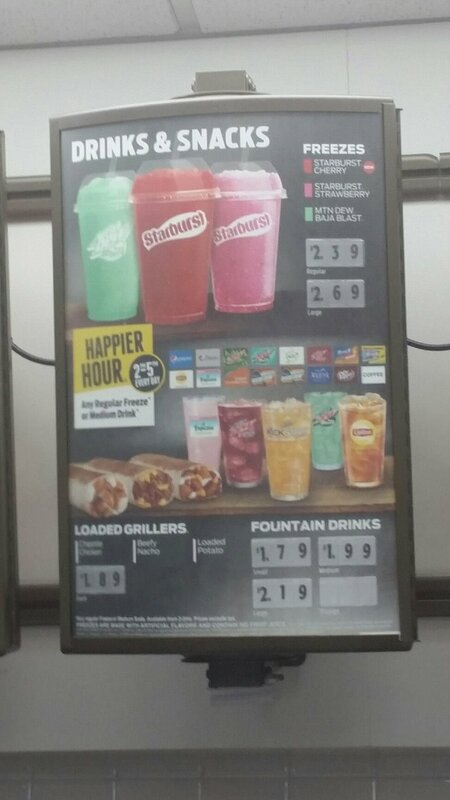 Have it with a drink for $6.19. This salad has a crispy fried tortilla shell and includes a base of beans topped with lettuce, tomato, sour cream and salsa and crunchy Fiesta fried tortilla strips. You can add dressing or have it with your favorite hot sauce. Try it with seasoned beef for $5.39. This monster burrito is full of rice, beans, and shredded chicken. It is then smothered in a creamy chipotle sauce, a red mole sauce and sour cream. This flavor packed giant meal will fill you up and satisfy your need for a bold taste. Have it in a combo meal with a large drink and a crunchy taco for $6.99. The first Taco Bell was opened in 1962 in Downey, California. Founder Glen Bell had started several other small restaurants and sold them to friends or investors before settling on Taco Bell as the restaurant he would later expand to a major chain. Within two years he opened 8 additional locations. The hard shelled taco was not as commonplace then as it is today and Bell’s innovation on perfecting that product is part of what has made the hard shelled taco an American staple of Mexican food. There were 100 Taco Bell locations, mostly in the Los Angeles area, by 1967. In 1970 the chain went public with 325 restaurants. In 1968, with 868 restaurants, Bell sold the chain to PepsiCo Inc. In 1997, Taco Bell was purchased by investing group Tricon. 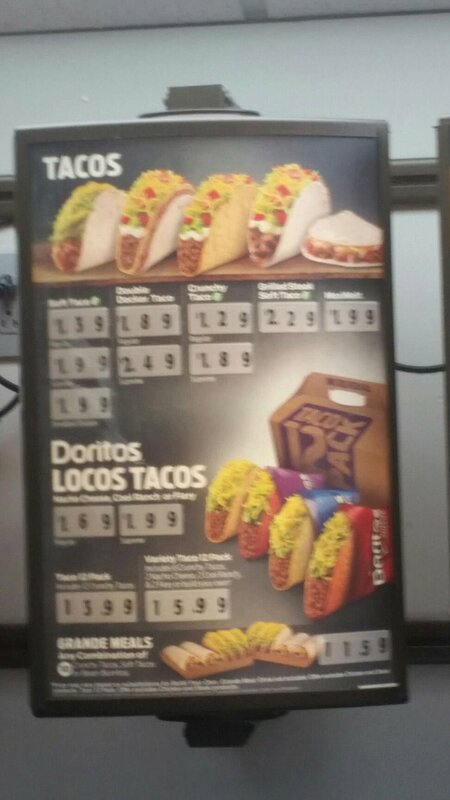 As of 2013 there were 6,500 Taco Bells. Fun Fact: The famous Chihuahua featured in the 1997-2000 television ad campaigns was named Gidget. She died in 2009 from a stroke at the age of 15. 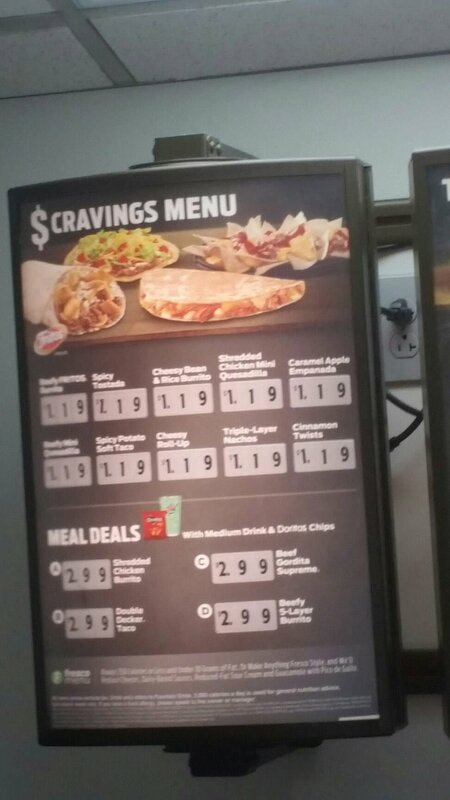 Taco Bell menu prices are subject to change without prior notice. Prices shown in images & the following table should be seen as estimates, and you should always check with your restaurant before ordering. 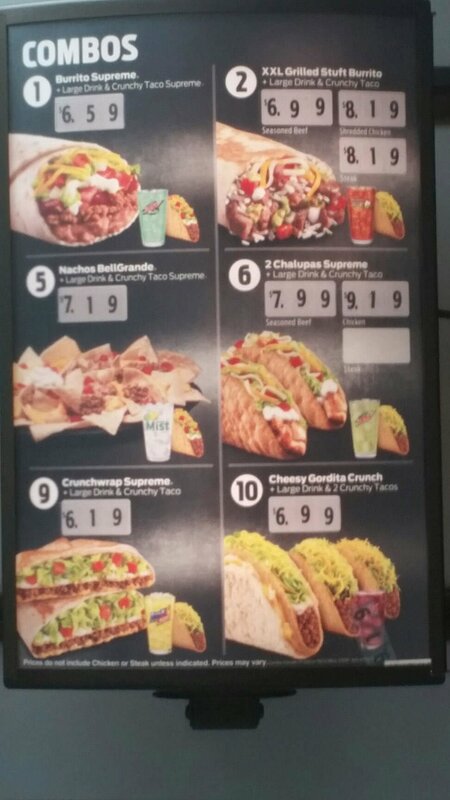 Taco Bell menu images sourced via e-mail from restaurant customer & menu-price.net user. menu-price.net does not guarantee the pricing or availability of any menu items listed in image or table format on this page. Pricing may vary from location to location.